Thank you so much for stopping by on my stop of the Wonderland Two Blog Tour today with Melissa Mortenson and Riley Blake Designs! It’s been so much fun playing with this darling line. Melissa’s beautiful range overflows with tea pots, sweet bunnies, charming florals, ginghams and beautiful shimmery gold accents. It’s all so lovely and colorful and perfectly sweet! And with so many ideas swirling in my head – I had a hard time deciding what to make. Those darling bunnies we’ve all fallen in love with (and notice their cute hair accessories!) called for some fussy cutting so I set out to make a little quilt featuring them. And I have a big crush on the florals and ginghams in this range so I kept pulling in heaps of those along the way. That little bow on the bunny above …. love, love those cute details!! P.S. If you happen to have an Accuquilt Go! This mini was made using the Go! Value Die (3 shapes in 1 – love! ), which made the cutting easy-peasy. 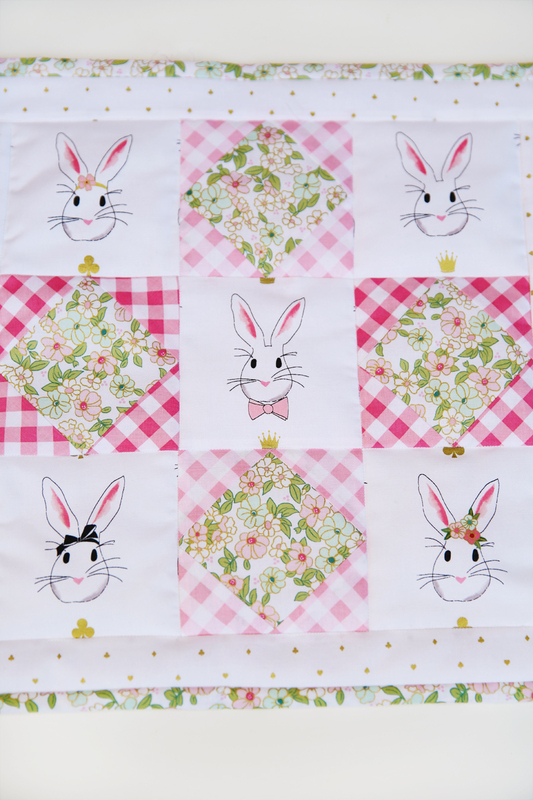 The squares are 4″ finished, which are perfect to showcase those charming bunnies. 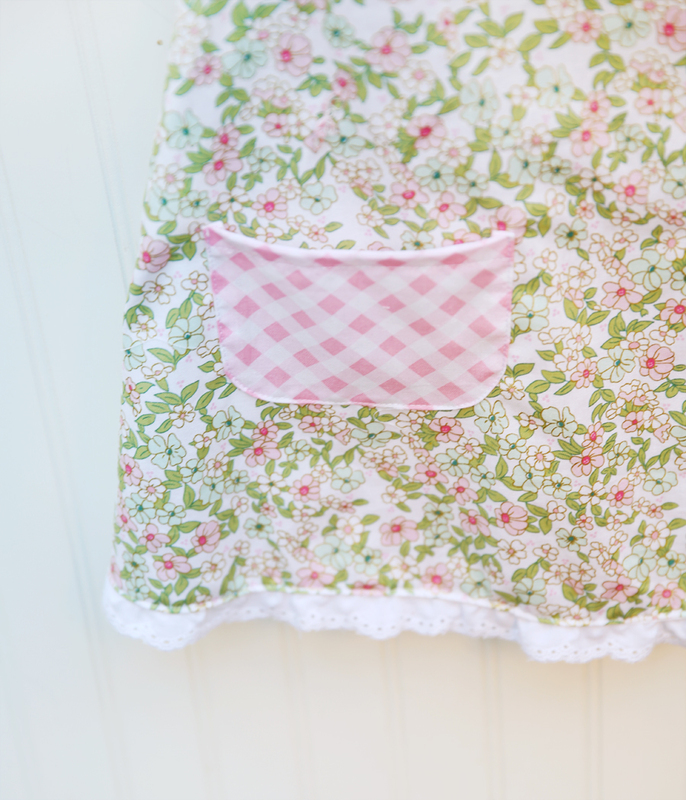 Playing with this range had me dreaming of spring and Easter dresses, too. 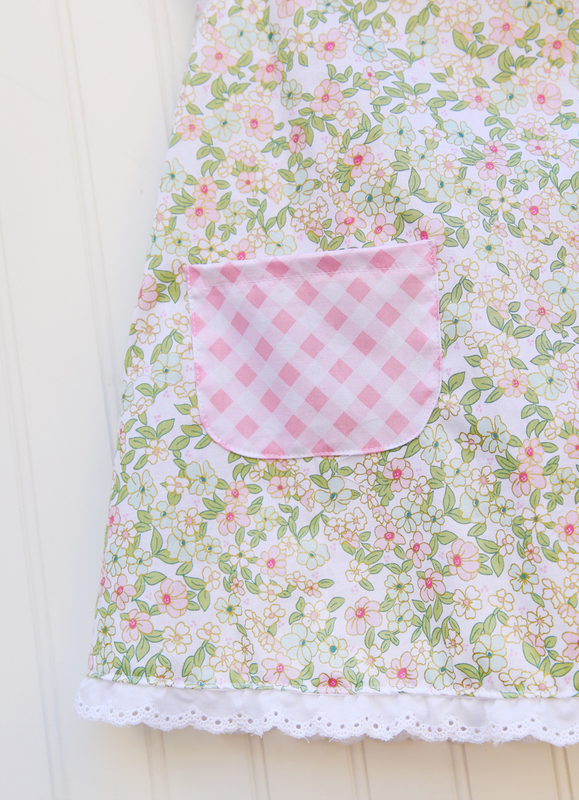 I created a spring dress with gingham pockets and a matching collar, adding some lace for a little icing on this floral cupcake! The dress pattern is from Simplicity (#9643), but I added pockets to mine. One last little peek at those cheerful, sweet flowers. This was one of my favorite prints from the collection, but they are all so delightful and sweet! 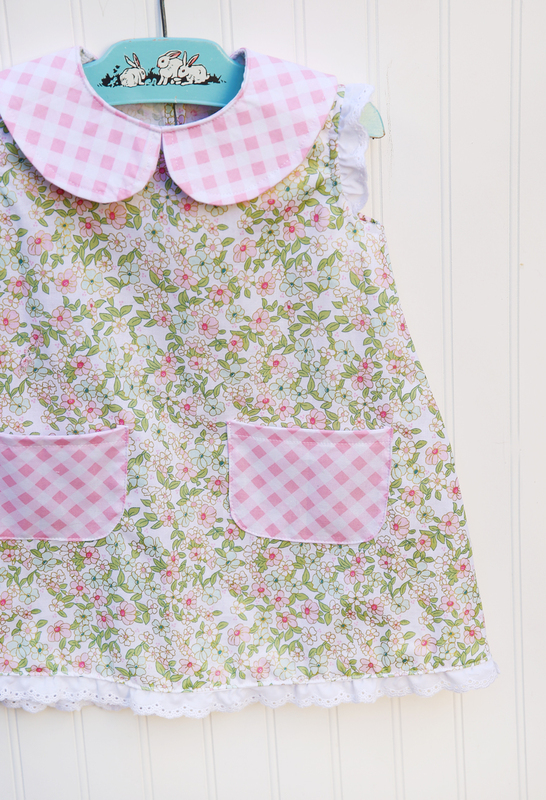 Thank you so much for stopping by for a visit with this darling range. Melissa, what a talent you are and what a beautiful range you’ve created for us all to enjoy! Next up on the Wonderland Two Blog Tour next week, is the talented Shari Butler at Doohikey Designs. So excited to see what Shari makes! I am having a melt-up! (opposite of meltdown!) I love bunnies.. have them all over my laundry room. Family banished them from all over the house 🙂 Where are these fabrics available for purchase? 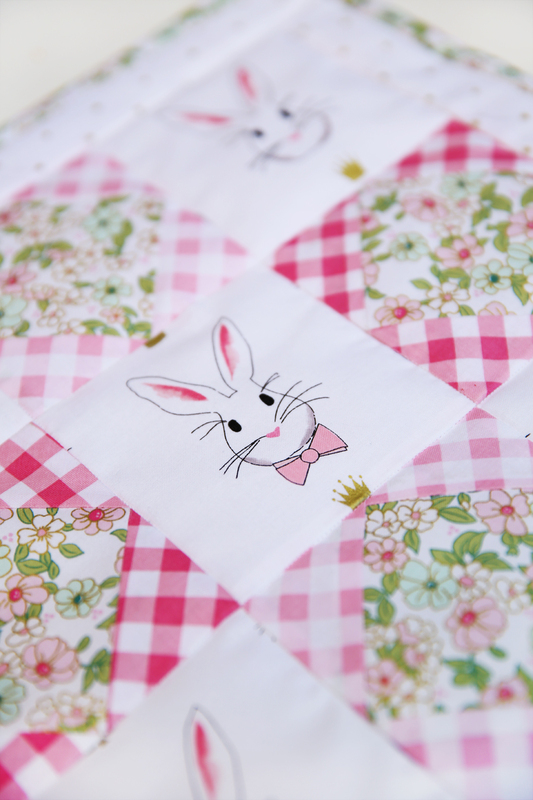 flowers, bunnies… wow love them! I am new here today..signed up for the newsletter. Thank you. Hi Ayda! Thank you so much for stopping by! Aren’t these bunnies so sweet! 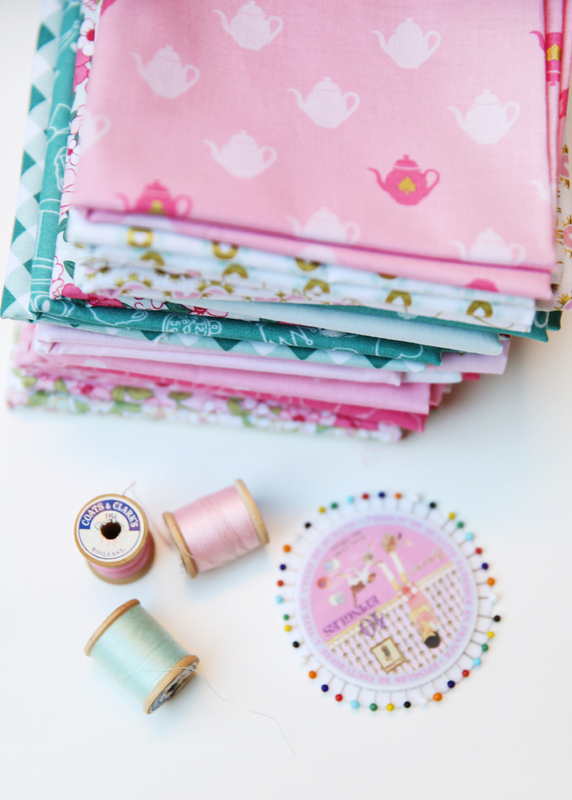 This fabric is arriving in shops now, available online as well. Riley Blake has a shop directory on their website, too if this is helpful: https://www.rileyblakedesigns.com/index.php?p=locator Thank you for signing up for my newsletter and for the sweet note! Thank you, Carol! This is a darling collection and was fun to play with. Thank you for stopping by for a peek! 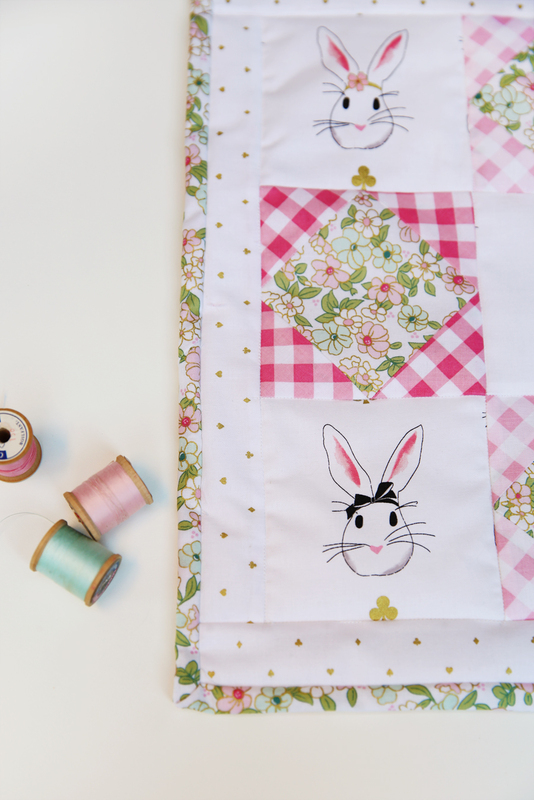 Is there a pattern for the mini quilt? What a gorgeous dress! I love it! I love all of your fabric!! Too darling. I’ve looked and looked for the little dress pattern and am having trouble finding it. Are you sure the number of the pattern is correct?? I just love that little dress!